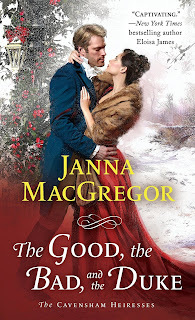 When I read The Bad Luck Bride, the first book in Janna MacGregor's The Cavensham Heiresses series, I was not inclined to be sympathetic to the secondary, villainous character of Paul Barstowe, former best friend of the book's hero. In book two, The Bride Who Got Lucky, there were glimmers of a better man - or at least the possibility of one - hidden deep inside and I began to wonder if there could be more to Paul than I had first believed. I queried the author and learned that the fourth book of the series would be Paul's journey to redemption and love. The Good, the Bad, and the Duke releases today and, as I suspected, there is indeed much more to this man than his previous behavior would have indicated. Not only did Daphne fall in love with him but I did too. In fact, not since Lisa Kleypas's Sebastian, Lord St. Vincent have I enjoyed a redeemed hero this much. Who better to match with a formerly dissolute, currently striving for redemption hero than his ex-best friend and current enemy's younger sister, right? As much as I enjoyed Paul, his heroine, Daphne is equally as wonderful. It was pure pleasure to watch her recapture the sense of self and adventurous spirit that she'd kept firmly on the shelf since the death of her sister and see her go to toe-to-toe both with her family over her relationship with Paul as well as with Paul himself. I adored these two together. The banter between them sparkles, their chemistry is off the charts, his tenderness with her is sigh-worthy, her defense of him is cheer-worthy, and the bond formed in their youth, while stretched to its limits by Paul's actions and Daphne's brother's enmity, remains strong and unbroken - a solid foundation upon which to build a love for a lifetime. Their beautifully paced evolution as a couple, as well as individually, engaged both my mind and my heart and put me firmly in their HEA corner. The Good, the Bad, and the Duke is not only my favorite book in Janna MacGregor's The Cavensham Heiresses series but also one of my favorite books of 2018. It has my enthusiastic recommendation. That is quite a positive review for this book. I am a little behind in the series but, clearly, I need to make the effort to catch up. I loved it! It can be read as a standalone but I think it's much better if you've at least read the first book in the series so you can see how much Paul has changed. Nice review. Can’t wait to read it. Nice reference to Kleypas’ St. Vincent. Hope you enjoy it, Eileen! Great review. Adding it to my wish list now. I've got the first books in the series in my tbr pile - I better get reading! I just started the book today. I can't wait to finish it. I love the review, and it's made me really anxious to read Janna's new book. I loved the review PJ and felt the same exact way reading this book. Thanks so much for the review and the recommendation. I'm sure I would enjoy this one - thanks!